Hey! Where did my listing go? In order to keep everything nice and tidy and going along smoothly listings and content may be removed as necessary. If you post your listing in the wrong category you may find it relocated and possibly a note in your email inbox with a ticket from the Tech Support/Moderating team saying that it was moved. But if you are a repeat offender you might find you listing has just up and vanished - check your junk mail/spam filter/other folders if using gmail you might have missed your warnings! Since we offer free listings in every category we really do insist you select the right one. Dating and Personals is for just that - professional services do not belong here! If you steal content written or images and we see it, or it is reported then the listing will be removed - if it is repeat content that is posted on the same or many accounts - the offending accounts will be blocked or removed or banned by various means. If you see your content being misused on Crockor please let our Tech Support Team know by using the chat feature in the bottom right. We do not have hard and fast rules about how much of what you can post, but if you post like a spam bot you get blocked like a spam bot. Posting very high volume of new listings in a short space of time may get you blocked - if you feel this is in error please contact tech support. Identical Listings posted in short succession in same or different categories, in the same or different locations can be suspect. This is especially so if the ad is in a category for a local service type business - you cannot be in every place at once. If you wish to place different listing focusing on different services your business offers - this is fine. It is best to change up the content and images a bit too. It is better for users, better for impressions and better for search engines who trawl through the pages. Links to pages not relevant to the listing, or high amounts of links, or links to paywall sites pretending to be contact links smell a bit like spam to a Crockor. If you do find your listing and/or account blocked - check your email or contact tech support if you feel it is in error. Making new accounts to start posting again are likely to get blocked too if detected as being the same content/user. Making more and more email accounts to get around blocks really does cement your impression of being a spammer. If you are unsure if your content is suitable or which category it belongs in just use the live chat feature in the corner and we will help you out. Nothing good can last forever, and for our busiest categories this holds true. Potential customers will only trawl through so many pages so to keep it fresh and manageable listings may have an expiry date. This can be as short as 28 days in the most populated categories. Expired listings do not vanish instantly, they do stop showing in search results within the site including broswed to results by following links. They can still be found by direct links. You can check the expiry date on the "My Account" page when logged in. You will also get email notification when listings expire - make sure you have Crockor whitelisted in your email account - if your verification email went to spam - chances are the rest might too! 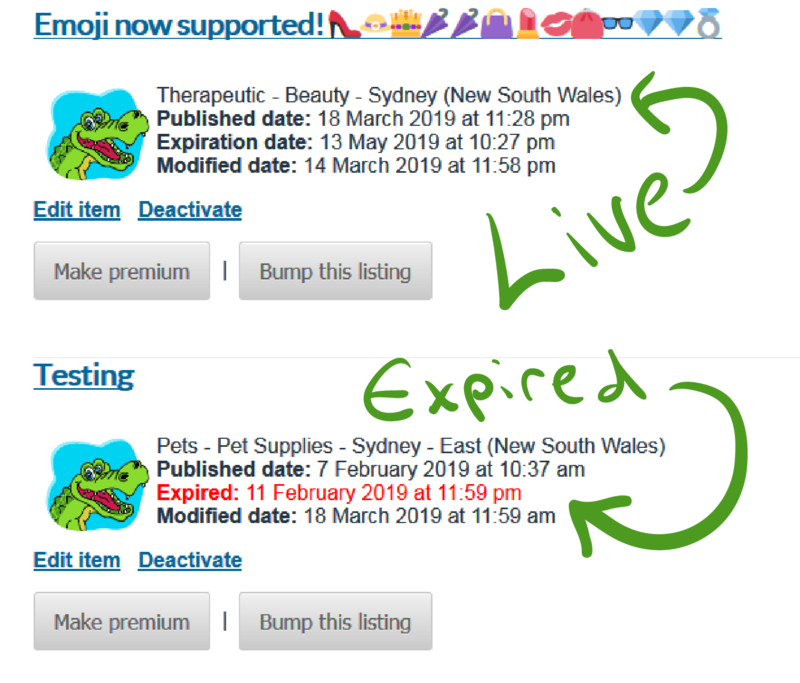 To keep your listing live, you can utilise the bump to top feature which will make it as if you just posted it today - extending the expiry and refreshing the post date so it shows at the top of the regular listings section until a newer listing is made. Alternatively you can manually recreate your listing as a new free listing. Bumping is the quick easy way and it also keeps any existing links around the web and in search engines active so can be better for helping potential customers find you. Expired listings may be periodically removed and/or any image attachments deleted. While we keep backups of what's live in the event of server issues, Crockor is not a place to keep the only copy of your written material. If your listing vanishes when it has expired, and you contact us quickly we may be able to recover the written content - though Google also has many listings cached as well. Please ensure you have copies of everything you post - maybe just email a copy to yourself just in case. Now look we aren't prudes around here - but some stuff just isn't cool. Racism, hate speech,threats, graphic/explicit content, images of minors in adult themed categories are just some of the things we've had posted and not wanted to keep around. Be repectful of the myraid of different folks who exist and we can all get along fine and your listings wont be removed. If you dispute payments made for buying tokens then you will be banned. If you then make new accounts and we detect that you are the same user - these will also be banned. We don't like being ripped off. Make sure you own the payment method you use, getting others to submit the payment for you is not reliable as they may later choose to dispute the charge. If you type slow, get distracted or had to nip off to the bathroom when creating or editing your listing you might find yourself logged out when you click to submit when you return. If this happens all the unsaved hardwork just vanishes - if it was never sent to us from a logged in user then it never got in our database. To avoid this heartache - select everything and copy it before you hit submit - so you can paste it back in - and/or open a new tab/window and log back in on the other page before you come back and click submit. If your listing contains bits a pieces which are dodgy or seem like potential security threat or you are hacking - these bits may get stripped out before you listing saves. This used to happen with emoji entered from mobile devices too - but that was fixed so you can do a huge pile of silly little pictures without the content following disappearing into the ether. 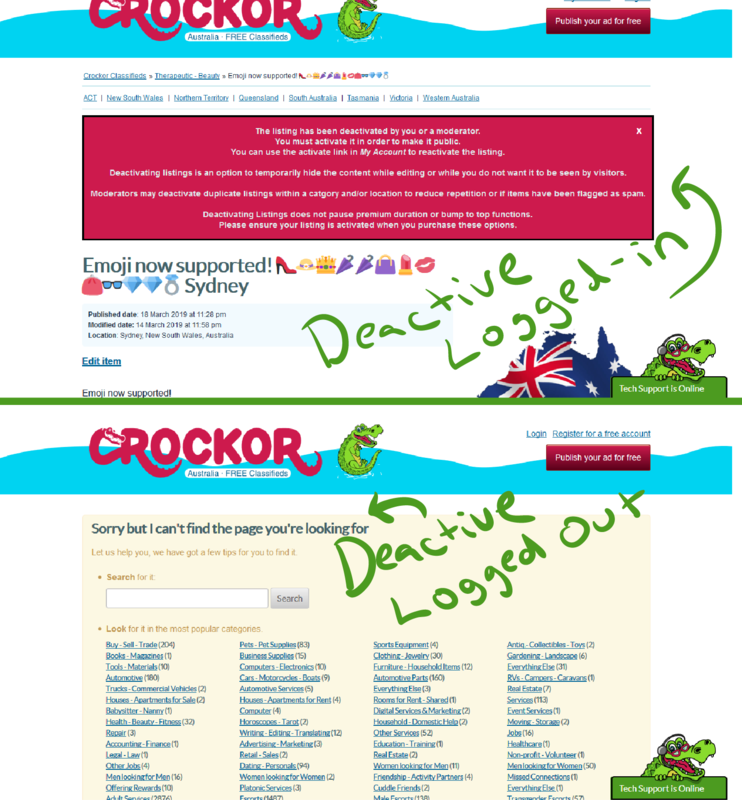 If you have clicked deactivate then your listing is hidden from site visitors and searches. This does not "pause" premium time or prevent new premium being added or bumps being done. To reactivate just click the Activate Link under the listing when logged into "my Account". We are working on having items automatically reactivate if a new premium or bump is done. We do our best to keep backups and things working as they should, but sometimes things happen. We try our best to prevent them but everything digital is only some 1s and 0s on a server somewhere. We cannot guarantee Crockor is always up and that your listing is live and your uploaded images havent gone or got messed up. We will always do our best though but please keep copies off all your created content just in case! How can I get a listing removed? First step if it isn't your listing is to report it. Every listing page has a little drop down bot which says "mark as". On a computer it is top the right side of the page near top of listing content, on a narrow browser or phone it is right down the bottom just before all the links to other Crockor sites. Using the options select the one that best fits and it will submit a report to the moderating team. If it is not immediately obvious why the listing shouldnt be there in your opinion - or it requires urgent attention if someone could be in danger - please also message tech support, the chat link is bottom right corner as always and a link appears in the thanks for submitting message which comes up after you have chosen an option. Sending a follow up message is very useful, as if you chose misclassified for example and it looks like it isn't to the reviwer then the report would just be ignored. Listings are not removed automatically so mass marking of listings will not get your competitors links to magically vanish. How can I remove my own listing? You can click deactivate - this makes your listing not live in search results. As shown below you will still be able to see the listing with a warning when you are logged in, but other visitors except logged in admins will only see an error page when following the direct link. Clicking activate turns it back on. You can just blank the content - edit the ad to remove the text - just put some spaces or other punctuation character if you get a too short error message. This can be combined with deactivate. You can message Tech Support - we have the option to permanently delete ads from the admin panel. We will require you to verify your access to the email/account. Editing a title on a deactivated listing to say DELETE helps us see that you have account access more quickly. We don't want to go removing listings if someone is only pretending to be you.